Voting for the Arts and Science Federation of Associations 2017 by-elections begins this week, running from Monday to Wednesday. ASFA represents about 20,000 students within Concordia University’s Faculty of Arts and Science. Quorum, the number of students that need to vote in the election for it to be valid, is 440. The last ASFA election to reach quorum was the general election in March 2016. All positions are open for this election because ASFA’s general elections in March 2017 were invalidated council. Chris Stephens, the former president of Concordia Classics Student Association, said that the former Chief Electoral Officer, Samuel Miriello, broke eight by-laws during polling, and extended polling illegally. 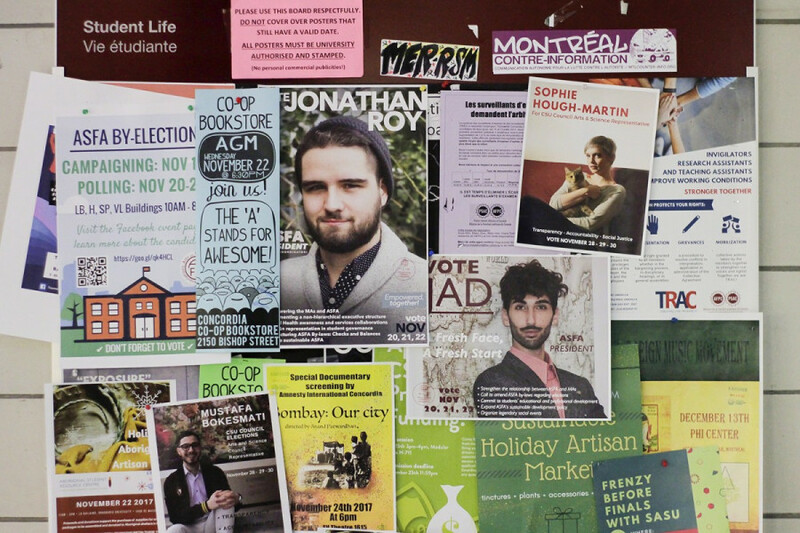 Jonathan Roy, Vice President of Internal Affairs, for the Concordia Classics Student Association, is one of the new candidates throwing his hat in the ring to become ASFA’s new president. His platform is very simple; he wants to empower ASFA’s students and member associations, become sustainable, focus on mental health, LGBTQ+ representation, and to restructure ASFA’s executive team in order to make sure that no one has too much power. Roy wants to introduce a new position, called the office of the consul, which would be an individual selected by council to be a representative of council on the executive team. “This consul would chair the ASFA executive meetings, be involved in the day-to-day activities of ASFA and make sure that the presence of council would always be there within ASFA,” he said. Roy added that this can be someone who holds the ASFA executive accountable. He also wants to make ASFA more than just an association that throws parties. He plans to do this by working with the Waste Not, Want Not campaign, in order to promote sustainability, and with Jack.org to advocate for mental health awareness. “Under my leadership, we can achieve that,” Roy said. Third-year Political Science student Jad-Faraj Abi Semaan is hoping to make his debut in student politics as president of ASFA. “People should vote for me because not only am I a fresh face, but I’m a fresh start […] and ASFA needs a fresh start and I think that a lot of students agree that it’s not a matter of how much experience you have, it’s about the dedication that you’re willing to put [into] the work that you’re going to do,” he said. Having been a polling clerk at the ASFA elections last semester, Semaan decided to run because he would like to see a complete change in how ASFA operates and treats its member associations. He would like to see equal representation of “all minority groups” within ASFA, including representation for the LGBTQ+ community and for Muslim students. Though he had always somewhat followed student politics, he never developed an interest in participating in them until he had a sudden realization this semester that his tuition money was paying for the decisions that student associations make, and that he wanted to be part of those decisions. If elected, he also hopes to change ASFA’s election process by implementing online voting. He hopes that this would encourage more students to vote and that it would be a more sustainable option. “Any tree-loving guy would cringe when they see the paper that they throw every year,” he said. He would like ASFA to work with the Debate Club and do debates every election. Rachael Hutchinson was appointed as ASFA’s interim VP Internal and Administration during a council meeting over the summer. When Hutchinson was appointed, she wanted to work on a handbook for making budgets and planning parties for ASFA’s member associations. “I made a commitment to ASFA and all the students and I still haven’t gotten the chance to finish the [Member Associations] Handbook,” she said, adding that there are other projects that she’d like to complete before her mandate is up. Being with ASFA for the last five months, Hutchinson has realized that it works at a different scale than a member association. Projects that she’d really like to work on can be cast aside to work on more pressing issues that can arise at any moment. Francesco Valente said he wants to continue his mandate as the vice president of finance. He initially ran and was elected as the interim VP Finance in the general elections in March 2017. Instead of campaigning for students’ individual votes, Valente, has been campaigning to reach quorum for this election. Valente said that since the semester started, working with ASFA and its member associations has been a bit of challenge. Therefore he’d like to organize his time to better handle the responsibilities of his mandate. Doing a double-major in Political Science and Communications, Nicholas Gertler has always eyed a position on ASFA and feels that now is the best time to get involved. Gertler is the co-president of NDP Concordia, and has experience in communications jobs with Health Canada. Gertler has also worked on political campaigns such as the federal NDP leadership campaign. If elected, he hopes to open up communication channels to all ASFA member associations, and make sure that their events are all well promoted. Gertler also hopes to create a single place where students can go to discover what ASFA and all its member associations have been planning. He would like to increase outreach so that more students are aware of ASFA through social media and also through class talks at the beginning of every semester. “I think that there is a group of students, a relatively large group, but it’s still a group that is often involved in student politics. I think that group is also often focused on the downtown campus so I really want to make an effort to reach out and expand the group of people that is involved in ASFA […] and particularly in terms of outreach to Loyola,” Gertler said. Christopher Czich wants to continue his original goal of being at ASFA for a whole year. Like Valente, Czich was elected as the interim VP of Social Affairs in March 2017. He wants to increase the diversity of the kind of events ASFA does. Czich originally campaigned on having ASFA events throughout the day, instead of only at night. Czich said that it was a lot easier to organize events like frosh, ASFA’s orientation event for new students, during the summer. He added that trying to balance his life as an ASFA executive and his life as a student has been a challenge. A lot of Czich’s campaign this fall has been spent promoting the elections and reaching quorum. Interim VP Academic and Loyola Affairs, Gregory Bedell is running for his position on ASFA again. He was elected in March 2017. So far, in his time with the association, he’s been working on ASFA’s interdisciplinary academic journal and working on assembling a board of editors with a creative director. He is also currently working with science member associations to hold a science fair next semester. “I think this is also just something that’s really going to help out students in the present or even in the future with their CV’s and getting into grad school, or even just getting jobs,” Bedell said. ASFA has been mandated to work on an assessment report to figure out how they can better serve the needs of students at the Loyola campus. Bedell and interim VP External Affairs and Sustainability Bianca Bruzzese have been working together on this. “Most of my classes are on Loyola and I do see that there is a gap in the attention paid to the campus, and I think that it’s really not an easy question to answer, and I think we need to focus on it,” he said. Previous to being elected as the interim VP of External Affairs and Sustainability during the general elections last year, Bruzzese had served as an independent councillor. Bruzzese decided to re-run so she can complete the goals she had when she was elected. She originally ran on a campaign to fix ASFA’s reputation around Concordia, as well as making sure that the federation was being sustainable when organizing its events. Before being elected, Bruzzese didn’t think that she would have to spend time on activities that didn’t pertain to her mandate. “ASFA is complex and there are a lot of different demands and expectations that are thrust upon us, and so I don’t think I realized that, when I started out,” she said. Last week, The Link published a letter written by ASFA’s interim president, Julia Sutera Sardo, where she explained that she will not be running in this year’s election. Sutera Sardo cited personal reasons for not running again, and a personal desire to take a break to prepare for law school next September. Sutera Sardo said that she would serve as interim president until her mandate ends on Dec. 1.